This book is a mesh of a straight forward history book and a photo book on Operation Epsom in 1944 outside of Caen. Usually books with this many pictures and maps etc. are a bit thin on the written history; not so with Battle of The Odon. Almost every page is covered with World War II pictures of people, places, and armaments. It is also filled with many pictures of the same from nowadays. The author has added tons of maps to enable the reader to follow along with no trouble. There are also many first hand accounts of the fighting to captivate the reader, but the author does not lose sight of the big picture. The roughly 280 pages of the book follow the British and German forces from June 25th, 1944 to June 30th, 1944. It is pretty amazing that the author has found this much info and pictures dealing with just five days of the Battle for Normandy. 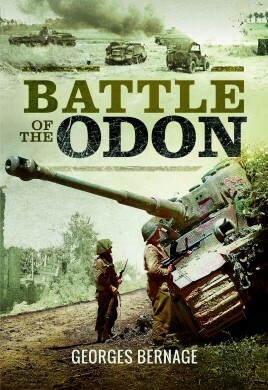 The book follows the desperate defense of the Odon valley by the German SS troops. To quote the author "The resources committed by Montgomery were extensive, especially considering the enemy only numbered a few hundred infantrymen, who were supported by a hundred or so Panzers". From Tiger Tanks to Bren carriers, all of the armaments are shown. This is also one of the few books that I have read on battles or campaigns that show the amount of civilian casualties and their plight. There are pictures of the poor civilians trying to escape the fighting, carrying everything they can of their possessions. It really brings the human part of the battle to the forefront. The author is painstaking in his efforts to tell the complete story of this battle. He also does not have an axe to grind, nor does he take any sides. This is history as it was meant to be, purely retelling an important part of our history without embellishment or any skew. The written history is done well enough for any history buff who normally eschews picture books. On the other hand, the amount of pictures and data is almost the same as a coffee table book. For those of you who actually remember any of the French you took, the author's books are available in English and French on the Casemate Publishers' site.